I.O.O.I.A.M.I.H. is an inexhaustive overview of the human efforts to handle the past, present and future production of information. Based on 9 representative examples, a broad spectrum of human operations unfold and reveal the massive - highly incomprehensive - endeavors to create tools and theories which are concerned with the production of ever growing information. 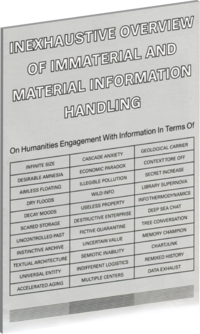 The ambitious economic and archival instinct to record, file, store and distribute the steady increase of information via ever-new instruments, materials and methods of info induction, can be observed physically and mentally. Inscribed onto and into the earth surface as well as in deep space, the human info-venture has turned us and our landscape into info-digesting and ordering specialists, which are at the same time able to accept that they will never succeed the quixotic task of keeping all information in a tidy order. The same can of course be said about the editor of this project, who attempted a similar impossible task; to assemble information about information in an information chart by using the most common source to harvest information - the internet – where the original information, extracted for the chart, might have already been morphed or turned into a dead link that is unable to retrieve.